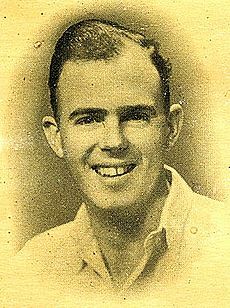 Australian bowler Bill Johnston, who led the Aussie batting averages in 1953. I admit that I’ve never really been a fan of batting averages, at least in terms of what it says about what we should expect from a batsman each time he walks to the crease. I understand the premise, i.e. the batting average is the average betwen dismissals rather than the average of all innings, and of course by now we have a feel for what the batting average tells us about a player’s ability. Now we can see that the 165 knock is a dramatic outlier and I think it’s fair to say an average of almost 60 is misleading as a guide to expected score in Bannerman’s case – in six innings he exceeded that figure only once. It was more likely that he would score somewhere between 4 and 30. Admittedly this is a small sample, but it does highight the potential problems with averages as currently utilised in ranking batsmen. Take as a further example Graham Gooch and VVS Laxman; they both played the same number of innings at 215, with Gooch outscoring Laxman by more than 300 runs, yet Laxman’s average is fully five runs higher than Gooch’s due to the latter’s low number of not outs (six, as against 34 by Laxman). But what else can be done to give a fairer approximation of a batsman’s ability? There are a number of ways to summarise central tendency in data, and for a string of numbers these are average (or mean), median and mode. For those of you who aren’t familar with theses terms, here is a quick definition – average or mean is the sum of all of the numbers divided by the sample size; the median is the midpoint of the data set when ranked in order, i.e. there will be as many numbers above the median as below it; and the mode is the value which is most represented in the data set. Why is the mean lower than the batting average? As discussed earlier, the batting average is the average between dismissals, whereas the mean here is the average of all innings incuding not outs. The median as mentioned is the midpoint, i.e. as many scores above 13 as below, and as can be seen this is much lower than the mean. The mode is the total most often scored, which is zero. The importance of selecting the most appropriate method of determining the central tendency of data is of course affected by the distribution of the sample. In a normal distribution, the mean, median and mode can be closely located because the peak of the sample data is central – however if we look at the distribution of batting scores they typically show a positive skew as in the example above, that is the peak is towards the left hand side of the plot, i.e. towards the low end of the scores. For this reason, the average or mean misrepresents the central tendency of the batsman’s scores due to the likelihood of a small number of high-value outliers, as seen with the example of Bannerman above. I would propose then that a better representation of the central tendency of batting performances, given their skewness, is the median. I don’t believe there’s been a detailed study of batting medians, at least I’m not aware of it, and so I’ve spent some time looking at all batsmen as far as the median of their batting performances is concerned. Going back to the skew, the larger the skew vaue the longer the tail stretching to the right of the graph; the average skew is around 1.5, whereas for example RE Foster’s is 3.5, indicating a much longer tail due to his one very large innings of 287 – the highest I found is Wasim Akram, who comes in at 4.8. David Steele by comparison has a skew value of less than 0.5 indicating (because it’s closer to zero) that Steele very rarely failed, meaning that the distribution of his scores was more “normal”. In statistics, the degree of skewness is usually taken as highly skewed if larger than 1, moderately skewed between 0.5 and 1 and approximately symmetrical (e.g. as a normal distribution would be) if lower than 0.5. The data for all Test innings is a highly skewed +2.55. With two not outs his average was 86.33, though the mean of the scores is 51.8. However the scores above the median (81, 88) are much closer to it in value (72) than those below (4, 14) which results in a negative skew of -0.55. The above values, representing as they do the midpoint of all scores, give a more realistic approximation of the actual score we can expect from a batsmen, wich is much lower than the batting average. So as can be seen, 30 represents a reasonable level of greatness, with some of the all-time greats achieving medians over 40. It can also be seen that there is a significant difference between the batting average and the median score, and in some cases this difference is significant. Another point to make about the median is that it will either be an integer or between two integers, e.g. 34.5 – this reduced granularity may also be a better way to rank batsmen than comparing averages to two decimal places. No sign of Bradman there. Turning to those batsmen who had a very small difference between their average and median, only twelve in the history of Test cricket have a median value higher than their average, the most significant of which was David Steele. Steele made an immediate impact upon his introduction to Test cricket, with five of his first seven innings being over 50 and none below 39, his median at that point being a whopping 66.0! While it dropped off somewhat after that he still ended up with a median of 43.0 (higher ithan his average of 42.06) and a very low skew value of 0.43, indicating he very rarely failed – 15 of his 20 innings were scores of 20 or more. It should be noted that the skew, while it is typically a reasonable indicator of consistency, will unfairly penalise those with long careers who have a number of high scores. For example, Lara has a skew value of 2.32, which would tend to suggest he wasn’t very consistent; however if we cap all of his high scores at 150 his skew value drops to a respectable 1.0. Some of these batsmen did not feature in many Tests, Bradman and Barrington being the notable exceptions – nonetheless it’s fair to say these batsmen demonstrated consistent performances. This can be conformed looking at the skew measure of scores – Lewis was discussed above, but Cyril Walters, who played 18 Test innings has a very low skew value of of +0.1; in only four of those innings did he fail to score at least 20. I have always felt that it’s unreasonable to consider that Bradman, as some have said, is 50-60% better than everyone else based on the difference between his average and the next best (depending where you place the cut off from an innings played point of view) – here, Bradman enjoys a lead of just over 20%, which is still very significant but may be a better measure of his superiority over the rest. Great work. I value consistency (median) as more important than averages. I would also like to see statistics on dot balls for one day match averages. It should also be remembered that cricket is a team game and not all batsmen played for the team, rather they played for themselves and is more readily apparent in the one day format. Question – are you taking the median of runs scored in an innings, or runs scored between dismissals? Request – could you please let me know where you got the data from to do this analysis? I’d like to play around with it as well.